Writings: Creating a fire ant biosecurity industry? Has the Queensland government, of both political persuasions, been creating the conditions for a new industry of private fire ant bio-security consultants: consultants to charge Queensland businesses and residents for services the State government has failed to deliver, with more than $350m of public money, over the past fifteen years? One reason to think so would be the massive increase in the size of the Fire Ant Restriction Area over the past fifteen years. It is now ten times what it was in 2001 and stretches from Redlands on the Bay, through Brisbane, Ipswich and Logan into the Scenic Rim, Gold Coast and the Lockyer Valley local government areas. The main cause of fire ants spreading is people moving them: ‘human-assisted movement.’ Businesses or residents who do not know that their premises are infested can accidentally or carelessly spread fire ants in loads of fire ant-friendly materials like soil, mulch, compost material, turf, hay and pot-plants. While fire ants can spread several kilometres when a young queen takes flight from her home nest to create a new one, truck-loads of fire ant infested soil or mulch can move fire ants much further; and they have. When fire ants were first detected in south-east Queensland in 2001, fire ant experts from the United States said the infestation was as bad as anything they had ever seen. It was likely that fire ants had been in south-east Queensland for years before they were detected. The experts said Queensland needed to urgently implement a program of ‘aggressive containment’ to stop the spread of this super-pest. That would mean legislation to make is illegal to move fire ants or fire ant friendly materials. It would also mean appointing enough biosecurity inspectors to identify the thousands of businesses operating in the Fire Ant Restriction Area who were moving fire ant friendly materials and developing compliance agreements with them: businesses like developers, landscapers, pool builders, earth movers, nursery and landscape suppliers, soil merchants, turf farms and others. Both sides of politics ignored this sound scientific advice. The Commonwealth government will fund an eradication program, but it will not fund a containment program. Anxious to secure Commonwealth funding, both sides of politics have declared that they can and will eradicate fire ants. They have now spent more the $350m of public public money on hundreds of field staff in a futile chase after the last fire ant to eradicate it at the expense of containing the spread of the fire ants we know about. Also, Queensland governments of both political persuasions caved in to industry pressure not to implement a program of ‘aggressive containment.’ There are costs associated with modifying business practices to reduce the risk of spreading fire ants. With the threat that business owners might not report an infestation if it was going to cost them money, industry groups pressured the government into allowing businesses to self-manage their risk of spreading fire ants. The Queensland government did so, and never appointed enough biosecurity inspectors. In 2002 when the Fire Ant Restriction Area was around 40,000ha there were twenty biosecurity inspectors who encouraged 1200 community minded businesses to adopt risk management plans. By 30 June 2015, with the Fire Ant Restriction Area up to 341,052ha, and with just a handful of biosecurity inspectors, the Queensland government has no idea how many businesses who deal in fire ant materials are operating in the Fire Ant Restriction Area and what they are doing. Consequently, in recent times, fire ants in loads of landscaping materials have infested the Queensland University of Technology site at Gardens Point and the University of Queensland site at St Lucia. Residents who took part in the ‘Join the Fire Ant Hunt’ for six weeks in early 2015 found 640 fire ant nests. Another reason to think that the State government might be creating the conditions for a fire-ant biosecurity industry are the provisions in the new Biosecurity Act 2014: passed in March 2014 and due to come into effect on 1 July 2016. The new Act allows the Chief Executive of the Department of Agriculture and Fisheries to appoint private providers as biosecurity inspectors, accreditors and auditors to provide services for containing the spread of fire ants and to charge the public for those services. Lucrative, long term consultancies such as these are likely to be attractive to any politician, manager or staffer who had been involved in the failing fire ant program after they leave government. It will be grossly unfair to charge Queenslanders for services the State government was supposed to provide with $350m of tax payer funds. 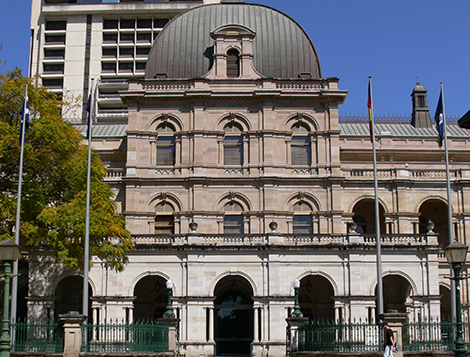 But the Queensland government started to push costs back onto the public in July 2013 when it declared that people could buy chemicals and treat any suspicious nest themselves, rather than wait for a biosecurity officer to do it. Up until then, people were discouraged from doing this because of the danger that they might get stung and accidentally cause the ants to spread. It is time the Queensland government implemented the advice of the US fire ant experts from 2001, and repeated by Australian scientists, to stop the spread of this super-pest with a program of ‘aggressive containment’.